So you’re thinking of sprucing up your bedroom with the use of a sliding door wardrobe. They’re stylish, they are space saving, and they can be personalised to go with the theme of your bedroom. Why not push the boat out and use your own specific image? What’s not to love with sliding door wardrobes Dungannon? We definitely can’t think of any negatives when it comes to getting sliding door wardrobes. But what do you need to consider when it comes to getting them installed? Do you have enough space available for them to be fitted? You will need to think about where in your bedroom they’re going to go, how much space they’re going to take up and be aware of how much room you will have to manoeuvre around them once they’ve been fitted. Then once you know you’ve got the space for it, it’s time to decide what panels you’re going to have on your wardrobes. Do you want mirrors for all of the panels or just a section? Are you going to have a combination of a mirror with wood or gloss? What colour or colours are you going to choose for your gloss panels? There are so many appearance options that you need to make sure you’ve chosen the right styles to go with the rest of your bedroom. Of course, the appearance is important, but is the wardrobe going to be functional in your room? And is it going to be well maintained? The tracks and door frames need to be taken care of as they could result in unwanted wear and tear. 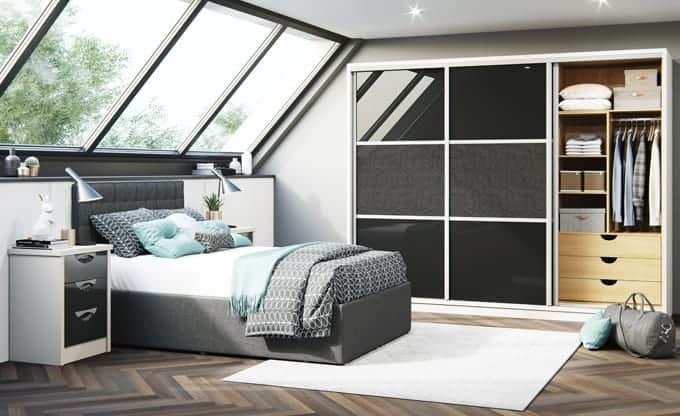 If this blog has helped you to realise that sliding door wardrobes are definitely what your bedroom needs, so why not check out our extensive range of sliding door wardrobes Dungannon? Get in touch with one of our team today and see what Starplan can do for you!